By Fran McVeigh What does summer mean in your community? Is it about freedom from school routines or is it about supports in place to help families maneuver the tricky days and nights when parents need to work and children have more freedom? 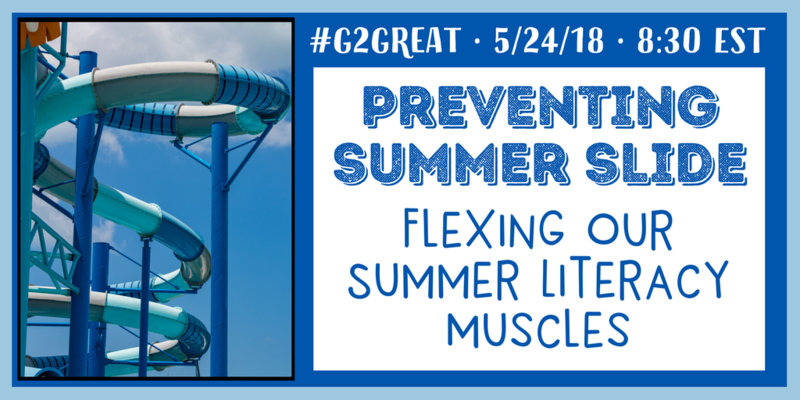 Our #G2Great chat on May 24, 2018 had both questions and answers for “Preventing Summer Slide” but also some cautionary reminders about remembering to meet the whole needs of children. “Summer Slide” is bigger than just literacy. In these days of declining school budgets and increasing demands, this may not seem feasible YET but let’s begin with some of those general considerations for increased collaboration and communication in your community. Have you considered these principles? 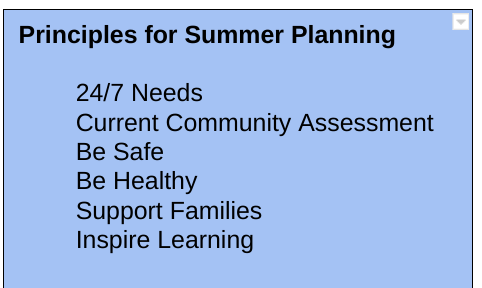 If your summer work is already planned, take a few minutes to think about the basic needs of the students in your community over the long summer break. Will they have adequate food, shelter and transportation? Will their basic physical needs be met? How do you know? What about their social-emotional needs? How will you know that your planned summer work is effective? What information will you be collecting from the participants and their families? Preventing Summer Slide: What will it take? Any and all of these actions allow students to continue reading, flexing their literacy muscles. With high levels of practice, just like in sports, students maintain their current levels of confidence and competence. Students who read, write, and talk about their passionate and/or pleasurable literacy work increase the likelihood of counteracting “summer slide”. If any of this work can also involve partnerships formed in the student’s own household, there is an even greater likelihood of maintaining or increasing skills over the summer when one or two hours per week are dedicated to shared literacy actions like a narrated photo book of fun and play during the summer! A second goal or process advocated for totally changing our approach to summer work is evidenced by this tweet. Would efforts be more effective if there was a deliberate plan to include the following components: community-based, culturally relevant, strength-based, family-centered and literacy-based in order to LAUNCH SUMMER LEARNING? What would each of these elements look like? Capitalize on activities available through county parks and recreation offices, municipal music/arts/museum programs, and even explore “service options” with elderly housing units. Weekly bingo games with senior citizens can be a treat for students and seniors. Plan field trips to locations in the community. Set up a comprehensive schedule that builds on Red Cross swimming lessons or open gym sessions. 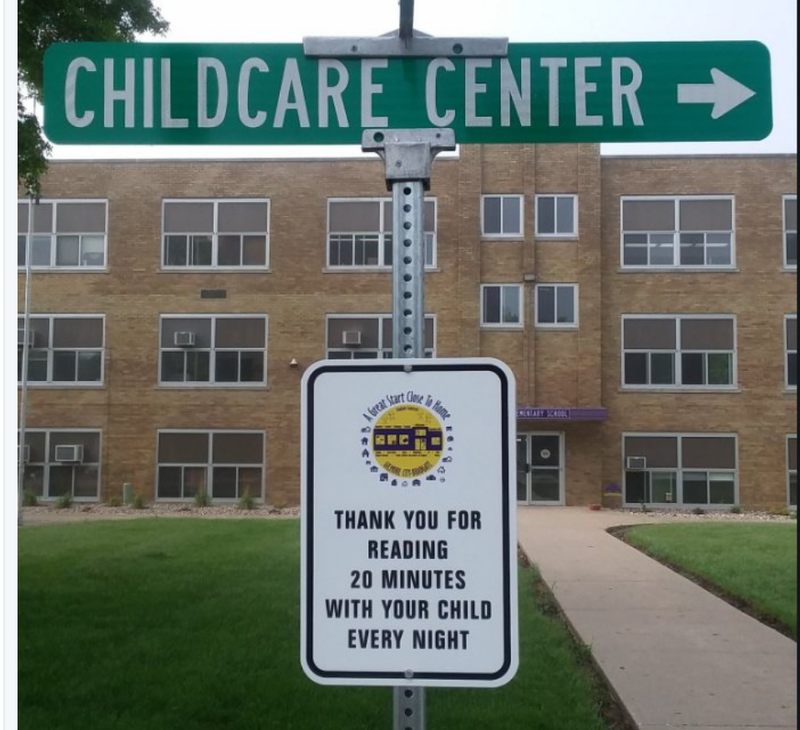 Evidence of community-based efforts to promote literacy would include this sign posted in Gilmore City, IA and shared via @herz6kids. Build relationships that cultivate strong culturally relevant interests and include teacher-student relationships that empower and motivate students. Check community calendars for meetings and events that provide cultural experiences. Promote peer teaching and learning relationships that may begin in books but further extend to face-to-face interactions. Allow students to have choices in activities in terms of recreational activities and sports as well as reading, writing, speaking, listening, drama, and math activities. Build on what the students can do, want to do, and mirror the lives they see at home and in their neighborhood. Build on strengths of the family by asking other members of their household to participate and respond to activities both at home and in the community. Create books of shared family stories and events. Encourage all family members to write about the same events from a different point of view. Collect recipes, songs, or poems to share with others. 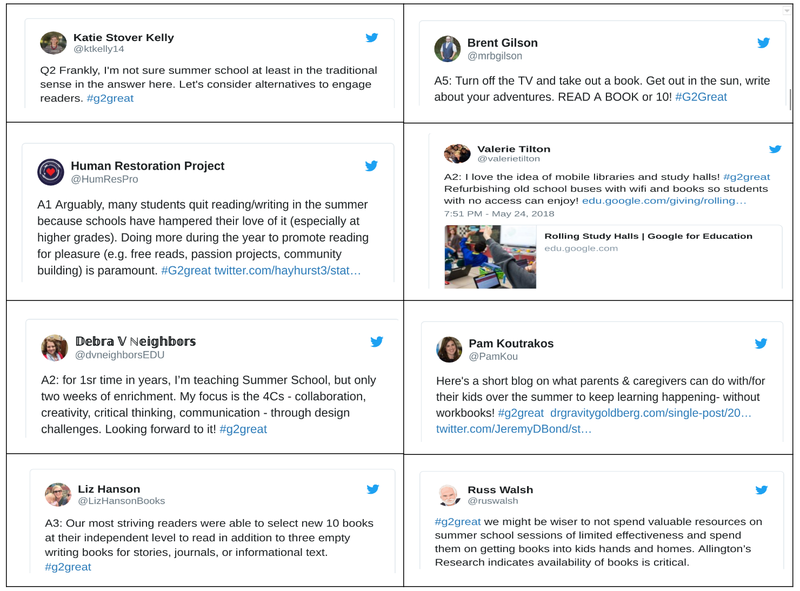 What if summer literacy-based work was about choice, wonder, passion, and not the same old routine from the school year? The use of Wonderopolis or independent choice would be one source of promoting joyful self-exploration that helps develop life long readers and writers. 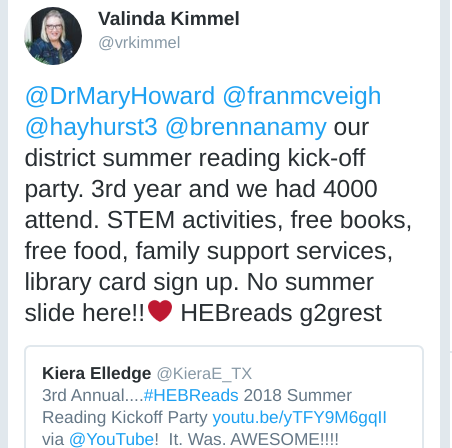 For further information about a successful summer launch and summer program, check out this tweet from Valinda Kimmel. This is such an important topic Fran and I love the way you approach it in such a respectful way from a broader lens. We have barely touched the surface of addressing the summer slide and as we wait idly by, more and more kids will be experiencing this slide and moving further and further behind. No child can afford for us to keep standing on the sidelines shaking our heads. So glad that you wrote about this topic in such a beautiful way! !